Taking the total number of Tyre Plus branches in the capital to 11, the new branch was officially inaugurated by His Excellency Saeed Abdul Jalil Al Fahim, Frank Bernthaler, CEO of Al Fahim Automotive, Sumit Chordia, General Manager of CME, Mohammad Al Haj, CEO of MBI, and Daood Helmi, Michelin Sales Director for UAE & Oman, in the presence of senior company executives, as well as media representatives, branch employees and members of the public. Mohammad Al Haj, CEO of MBI, said “We, at MBI, are proud to partner with the renowned Michelin TyrePlus brand, CME and Al Fahim Group. We are now providing residents in our neighbourhood with additional car services all under one roof at One Stop Centre. TyrePlus is a one-stop-shop offering a wide range of tyres, lubricants, batteries, suspensions and braking systems from reputable brands. With the support of trained staff, the new branch offers professional car maintenance services at competitive prices. The range includes fit-out of tyres, balancing and alignment of vehicles, air conditioning recharging, oil and battery change, and nitrogen inflation. The new branch is open Saturday through Thursday, 10am to 10pm. 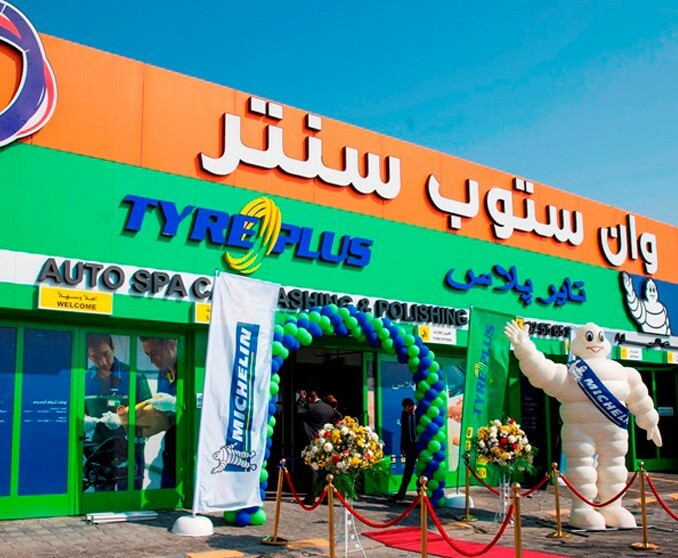 Founded in 2002 by the Michelin Group, TyrePlus offers services through more than 1,500 branches across 15 countries. TyrePlus is the first and largest car maintenance network in the GCC region, with a total of 108 branches across the GCC countries. CME offers a diverse range of products and services to the UAE's retail and wholesale markets with outlets in Abu Dhabi, Al Ain, Sharjah and Dubai. Since inception, CME has expanded its portfolio attracting complementary brands with exclusive agency agreements to the UAE. The company functions under four major divisions: Tyres, Automotive Parts, Services and Power Tools.